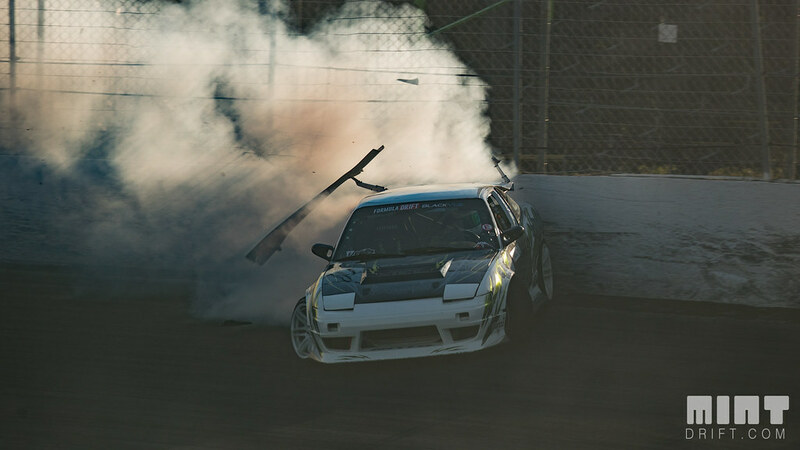 At the second round of the Formula Drift Pro 2 season at Orlando Speed World, Matt Madrigali took home a third place. This puts Matt ever closer to the top of the standings. Let's see his point of view for this round. The event started off great. We landed and picked up our rental van at Enterprise. We reserved one of those little Ford Transit vans. We waited over 30 minutes, so customer service said our fuel would be free. This was great; we needed it so we could run AC. Not only did we get free fuel, but they gave us a huge full size van! Thanks Enterprise, please sponsor me. Enough about rental cars. We got to the venue earlier than we did in Atlanta. We met up with Red Baron Racing and helped set up. Big Country Labs helped us out with new custom wing stands. This allowed us to run the wing for Round 2. The stands were redesigned to be slightly shorter to meet the Formula Drift rule book. I love the way the new wing stands make the car. Unfortunately that would be short lived. Practice went well. We made some small adjustments to the car. We started with the 4.3 gear set, swapped to 4.0, and ended up with the 3.9 for main competition. The Sikky quick change differential setup let me stay in 3rd gear and run the whole track while also giving me the wheel speed to climb up the bank. Went into qualifying feeling confident. First run was solid with a 75. Went into the second run and tried to throw down an even better run. I shot through the gate and ended up spinning up the rear a bit more than expected and slid down the bank. Initiated low and tried to make up for it with a heavy right foot. Unfortunately ended up hitting the wall slightly harder than I wanted to, ripping the wing off. The damage was purely cosmetic so we just took it all off and buckled down for the comp on Friday. We qualified 11th and were slotted against Ryan Litteral again. I was actually was excited for a bit of revenge. As I qualified lower I had to do my chase run first. I jumped the light just right. I was able to initiate right into his door and stay decently close on the bank. He's got 2x my power so I did fall back through the run but I was able to run my line and make no major mistakes. My lead was clean and he had a few major bobbles. We moved onto the great 8! My first win in Formula Drift! Top 8 we went against Austin Meeks. His car is faster than Litteral's, so I knew I needed to jump the light again. Basically the same story. I entered as close as I could and drove my line. On my lead he must have had a problem or overthought it because he didn't even leave the line until I entered the bank. He cut line and used his power advantage to close up but we took the win! Top 4! We lined up to follow Jeff Jones for a chance at the finals. My lead and chase was definitely the best of the weekend. Jeff is an unbelievable competitor and a very constant driver who figured out how to follow me without any real problems. We lost the battle but as we qualified higher than the loser on the other side of the bracket we ended up getting our first Formula D podium finish in 3rd place! This result means everything to me. I've been dreaming of this since I started drifting 12 years ago and I still can't believe that it's come true. All the money, effort, blood, busted knuckles, disappointments and long nights have finally started to pay off. The next round of Pro2 is Texas and I'm ready for the challenge. I want to find some more power before heading to the lone star state. Orlando helped mask the power deficit we have but in Texas it won't be as easy. I want to thank all my sponsors who have been a major support of my program. It's cliche, but all of the drivers really do owe a debt of gratitude to all these fantastic organizations that have put their support behind us.